We're battling stomach flu in my house right now so please bear with me if I'm absent from my blog on occasion. Today I'm sharing with you another ABC challenge design & this week we're asking you to create a CAS--Clean and Simple--card. I personally find CAS to be quite challenging but I think I did pretty good with this one. Check out our blog to see what the rest of the DT came up with & after you've been inspired; you'll have until next Sunday, January 13, 2013 @ Noon EST to link your creations. I can't wait to see your wonderful works of art!!! Have fun & happy stamping!!! I hope to have another post on Wednesday but that will depend on how my daughter Bianca & I are doing. Thanks so much for stopping by & have a great rest of the day! Jackie, this card is gorgeous... love the embossing! This is just beautiful, Jackie! I love how crips and clean it is and the embossing folder you used looks so pretty! This is gorgeous!!! I love that embossing and the blue and crisp white together. I hope all of you are feeling better soon. Big Hugs! Gorgeous card. I love that look of a lacey border and the flower paper is beautiful. You did a fabulous job with the CAS challenge. Thanks for joining us at Glitter n Sparkle this week.. This is beautiful!! Simply gorgeous! Oh Jackie, so sorry you and your husband were sick. Glad to hear you are somewhat better and hope both of you are back to normal very soon. Gorgeous card! The flu visited our house over the holidays -- no fun! I just love the idea of how you cut the image out with the circles. I do hope you are on your way to feeling better soon! A very elegant and beautiful card. Thanks for joining us at Fashionable Stamping Challenges this fortnight. It's a lovely card - such a beautiful design and great choice of colors! Your card is truly lovely Jackie. The construction is flawless. Thanks for playing with us at 613 Avenu Create. Jackie - This is so pretty! It reminds me of fine china! I love it! This is a very nice, clean and simple card. I may have to give this one a try. :-) Thanks for joining us at 613 Avenue C.
Beautiful project! I love the embossed belly band! Very nicely done! Thanks for dropping by 613 Avenue Create! We hope you will visit us again, soon! This is gorgeous! I love this - I never would have thought to use just circles of dsp, it's simple and yet elegant! So sorry you are still under the weather! Hope you feel better soon! Your card making ability doesn't seem to be affected too much! This is so pretty and delicate! 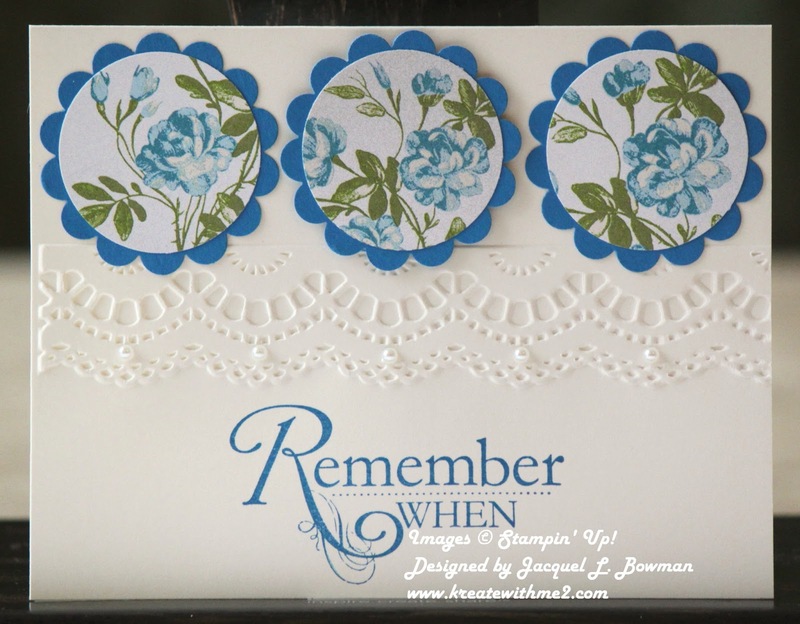 You always make SUCH BEAUTIFUL cards, Jackie! I love the colors and the layout and the texture...it's all beautiful!! SO lovely! Vintage without being cluttered...perfect! Fantastic card and thanks for joining us at SFTW this time. I LOVE this card - such a simple and beautiful design. Love that lacy edge. Very pretty, love the colors.. Thanks for joining us at Challenges 4 Everybody. Good Luck! !